So for a few days there has been a “laxed out” ride advertised on kiwibiker. The Sunday weather seemed agreeable, so I left home at 10am headed for the meeting spot for the is organised ride. First off I noticed it mainly consisted of a bunch of people I have not ridden with before. Paddy was there (fully recovered from bouncing off a car a year ago) as was baine, but all other members were new to me. I always inevitably apply a few rules when riding with a new bunch of people. carefully carefully is the go, as I have no idea how they ride, what rules they apply etc etc. So gently I join the back of the pack leaving from kingsgate hotel on Te Rapa. The bladder was crying so I pulled out from the group and stopped at Te Kowhai for a pit stop. Back on the bike, and it is catch up time. So the throttle gets pulled. 30kms later I have passed everyone, and I tucked in behind paddy cruising. He leads us down to Otorohonga, with a bit of a diversion down Waitomo valley road. A stop at Otorohonga for smokes, more pee stops, and an undress to cool off a bit. North from Otorohonga, and my bike jumps out of 5th and into neutral. This is the second time in 2 weeks it has done this, I’ll have to do some research to figure out why. Needless to say, it gave me the shits, and Mr blackbird goes passed, probably thinking “WTF is up with this hornet ?!?!?”. After a bit of recovery we head east down Arapuni road. This is another road I know quite well, so although I’ve backed off a bit after my false neutral, I’m not lagging behind, just being careful with throttle on corners. as we head around Mangatautiri, I think “bugger it” I’m determined to dispatch baine on his gsx750f and then the blackbird, however the presence of gravel slows my determination, and soon enough we discover paddy parked on the side of the road to allow others to catch up. 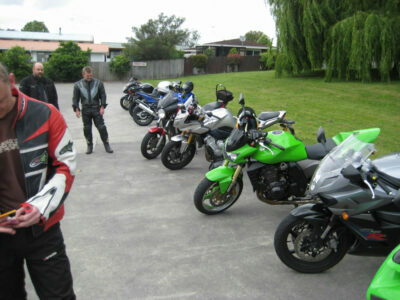 Discussion had, we decide the next stop should be Te Rapa tavern for a beer. Kaipaki road and guess what? Mr Plod with lights ablaze. Mr Plod, however, has to wait for 15 bikes and seven cars to pass before he can do a u-turn and chase down paddy, at least I reckon it was paddy he was after. Later on I find out Mr Plod had given up, and flicked his lights off, not bothering to try and chase us down. We also scattered, and went our separate ways, just in case Mr Plod was going to have a go. The day ended with a beer at Te Rapa Tavern with Paddy, Baine, Mister.koz, and myself. Back tyre is shagged tho; so I better go shopping today, to get me through summer.